Apple today announced on its website (via Setteb.it) that it will be opening a new retail store in Marghera near Venice, Italy this Saturday, October 11. The store will be located in the Nave de Vero shopping center, which spans multiple floors and hosts over 100 stores. 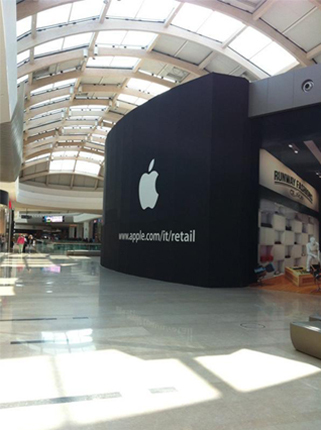 Apple put up its traditional black barrier at the location earlier this year, as some pictures have shown the location occupying a large space on the shopping center's larger floor. The new location will be Apple's 15th in Italy, joining stores in Rimini, Florence, and Bologna. At store openings, Apple usually hands out commemorative T-shirts to the first 1,000 customers to visit. Apple's new store in Venice opens at 10 A.M. this Saturday, and the location has begun accepting reservations for workshops and Genius Bar appointments. Update: Apple is also opening new retail stores in Marlborough, Massachusetts and Trumbull, Connecticut on Saturday, October 11. Update 2: The expanded Houston Galleria store will also be opening on Saturday after operating out of temporary space since earlier this year while its main space was renovated and expanded. Wow! So mysterious. Can't wait to see what it looks like with the barrier removed. /s. (In case it wasn't obvious). Worth noting that this store is a typical mall store in the industrial mainland area of Venice which is normally bypassed by tourists who come and go from the island. If you are interested in the unique architectural challenge of making an Apple Store in historic Venice, forget it. Was thinking the space looked pretty mundane. Ahh, we are spoilt, it's probably 10x better than some I've seen in the US in malls. Glendale Galleria I mean you.